Turn a glass of water upside down without letting the water fall out. The secret to this trick involves some basic lessons in air pressure. Best performed over a teacher's head. Fig. 1: The upside-down water trick. Fill a glass part way with water. Turn it upside-down. You now have water on the floor. Why did you listen to me? Pour water in the same glass again. Put an index card over the mouth of the glass and press the palm of your hand on the index card, pressing the card against the rim of the glass and depressing it slightly into the glass in the center (this part is very important). While your hand is on the index card over the mouth of the glass, invert the glass and slowly take your hand away. 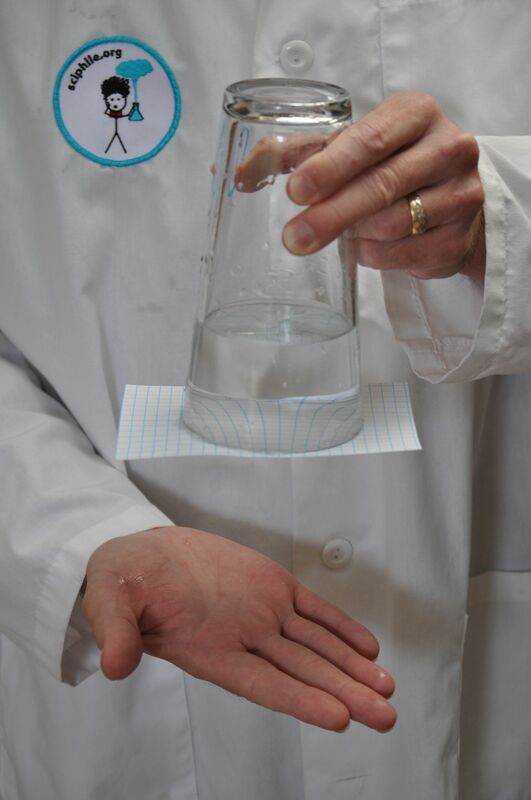 If you hold the glass steady and level, the water should remain in the glass (Fig. 1). Why doesn't the water fall out of the glass with the index card? The answer has to do with air pressure. Any object in air is subject to pressure from air molecules colliding with it. At sea level, the mean air pressure is one "atmosphere" (=101,325 Pascals in standard metric units). This air pressure is pushing up on the card from below, while the water is pushing down on the card from above. The force on the card is just the pressure times the area over which the pressure is applied; that's the definition of pressure. $$Force=Pressure\times Area$$ If you've done the trick correctly, the force from the air below exactly counteracts the force from the water above, and the card stays in place. Fig. 2: Diagram showing the relevant forces on the water. The blue arrows indicate the forces due to air pressure above and below the water. The red arrow indicates the force of gravity. Together, the three forces balance out to cancel each other. The details of this delicate balance are more easily understood by looking at the forces on the water, rather than on the card (see Figure 2). The card transfers the force of the air pressure upward to the water, so there is a pressure of (almost1) one atmosphere pushing up on the water from below. Of course there is also pressure from the air inside the glass pushing down on the water from above. The air inside the glass was originally at one atmosphere of pressure when you put the card over it, but when you inverted the glass and removed your hand, the water moved downward a very slight amount (perhaps making the card sag ever so slightly), thereby increasing the volume allotted to the air. As the air expands to fill this increased volume, several things happen at once. The air molecules spread out so that fewer of them hit the edges of the volume each second, and they slow down so that they don't collide with the container quite as forcefully. As a result, the air pressure goes down a tiny bit according to Boyle's Law. Now the pressure inside the glass pushing down is not as great as the outside pressure pushing up, and this pressure difference is enough to counteract the gravitational force pulling down on the water. Once the card sags enough so that these three forces balance, everything will stay put. For a typical sized glass about half full of air, an air volume increase of less than 1% generates a big enough pressure difference to support the weight of the water. There is another separate effect that helps keep the water in the glass. Water molecules have a strong attractive "cohesive" force between them due to the fact that each water molecule can make four hydrogen bonds with other water molecules. (This cohesive force is the origin of surface tension.) In the upside-down glass, it helps prevent the first water drop from separating from the rest of the water volume. As a result, the pressure difference required to keep the water in the glass is less than would be needed if there were no cohesive force. In containers with a small opening, like a straw, cohesion plays a bigger relative effect. This is why you can keep water in a straw just by putting your finger over the top, leaving the bottom open. Cohesion adds the extra force necessary to overcome small instabilities in the water. Why doesn't the water stay in the glass when we don't use the index card? This is really an issue of stability. In principle, if we could invert the glass of water so that the glass was perfectly level and the water was perfectly still, the forces would balance as before and the water would stay in the glass. In practice, it's impossible to achieve these conditions without the help of the card. If the glass is tilted ever so slightly to one side, or if there is a tiny ripple in the surface of the water, a drop of water will fall out of the glass on the low side, and a bubble of air will enter on the high side to make up the missing volume. Then another drop of water will fall out and another bubble of air will enter, and the process will accelerate until all the water is emptied out of the glass. With the index card in place, the water surface is kept flat and the pressure is evenly distributed over the entire mouth of the glass. For much smaller openings, surface tension is enough to stabilize the surface, and we actually don't need the index card. Surface tension demands a certain minimum size for a drop to form; as the first water molecules begin to fall, they pull other moleules along with them until there is enough weight to overcome surface tension and separate a drop. In a narrow straw, there isn't enough room in the opening for both a drop of water to fall out and a bubble of air to flow in at the same time. Does the shape of the glass matter? Only to a small extent. A glass that is tapered, with the base smaller than the mouth as in Fig. 2, is a little easier than a bottle with a narrow mouth and a wide base. The reason for this is that in the case of the bottle, the card has to sag by a bigger amount in order to generate the necessary volume (and pressure) change. If the card sags too much, it is likely that some water will dribble out the crack on one side and some air will bubble in on the other, and the balance will become unstable. Note for geeks: In the case of the tapered glass, it might be tempting to think that even if the air pressure were the same on top and bottom, the force pushing down on the water from above is smaller than the force pushing up from below because the area is smaller above the water than below. However, this argument fails to take into account the force from the sides of the glass. 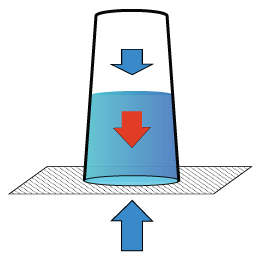 If the glass is tapered, the sides of the glass exert a force that has a small downward component, and this component exactly makes up for the reduced area directly above the water. If the air pressure above the water is exactly equal to the air pressure below the water, the upward and downward forces (counting the sides of the glass) are also exactly equal. Does the water always fall out of your glass? Try using a lighter more flexible material across the mouth of the glass. A heavy, very rigid plate won't work very well. Remember to press into the glass a little bit before you turn it over. Make sure the glass is perfectly rigid. If you use a soft plastic cup, the cup will compress as the water sags, preventing a pressure difference from building up. Use a glass that has a mouth bigger than the base (see "Does the shape of the glass matter? above). Does the water soak through the index card too quickly and make a mess? Try using a foam picnic plate instead of an index card. The foam plate is impervious to water, but it still provides the flexibility needed to depress the plate slightly into the glass before turning it over. For students who already have the concept of air pressure, it's often worthwhile to let the class brainstorm about why the water stays in the glass before leading them through an explanation. In this case, you might let them experiment with both a rigid glass and a soft plastic cup (which won't hold the water — see "troubleshooting" above) in order to identify the important difference. Give the plastic cup to your most troublesome student and stand back. For students who know calculus, it might be a good exercise for them to try to calculate the optimal amount of air to leave in the glass. Use a cylindrical glass instead of a tapered glass to make the calculation a little easier. Have them derive an expression for the distance the water must fall in order to balance forces. They will want to minimize this distance as a function of the height of the air column. The solution is a somewhat messy quadratic equation, but they can plug in typical numbers for the height of the glass, the density of water, the density of air, and assorted physical constants, to get a numeric result. 1. Strictly speaking, the upward force on the water is actually the upward force of the air pressure on the card, reduced by the weight of the card, which is assumed to be very light. This is explained very well. This is explained very well. Great lesson here saving this for sure!